Kidderminster have signed QPR striker Dean Sturridge on a one-year deal. 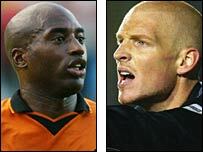 The 32-year-old scored 53 goals in 190 league appearances for the Rams, and had spells with Leicester and Wolves before joining Rangers in March 2005. He will be joined at Aggborough by Tamworth goalkeeper Scott Bevan, 26, who has also signed a one-year deal. The ex-Southampton trainee joined the Lambs from Milton Keynes in January after a successful loan spell, but then needed emergency kidney surgery. Having recovered from the operation, he will compete with Steve Taylor for the goalkeeper's jersey at Kidderminster. Harriers boss Mark Yates has also recently captured defender Mark Creighton from Redditch United, striker Andy White from Notts County and defender Stuart Whitehead from Shrewsbury.